The final act in our snow drama is about to unfold. A surface warm front is now pushing on to Washington's southwest shore and the upward motion associated with it is producing a band of precipitation moving northward (see radar at 9 AM below). With cold air holding on temporarily at the surface, snow is falling from Tacoma southward. The snow should reach Seattle by 11 AM and move northward during the subsequent hours. Puget Sound land should experience a few hours...and a few inches of snow... before warming aloft results in a transition to rain at elevations below roughly 500 ft by around dinner time. This is a very difficult forecast. In fact, one of my colleagues at the National Weather Service (Jay Albrecht, an excellent and experienced forecaster) called it the hardest forecast he has had to do in 32 years. Snow forecasting is hard. One with an active transition from snow to rain is very hard. And we are dealing with the achilles heel of many of our forecast models: they tend to mix out low-level cold air too quickly. So as good as the models are now, forecasters like myself need to make some manual correction for this situation. Keeping this model issue in mind, here is the predicted 24h snowfall ending 4 AM Tuesday. One is struck by the huge amounts in the mountains, particularly in the central and southern Cascades. Substantial amounts over NW Washington (4-8 inches) since the cold air should hold in there longest. And around a half inch to a few inches for central Puget Sound. But considering the model tendency to mix the cold air too soon, I think the above totals are too conservative. 1-2 inches around Seattle would be reasonable. Less near the water (where it is warmer). But there is a lot of uncertainty in this forecast. This afternoon we will transition to mixed rain/snow and then rain this evening. Temperatures tomorrow will zoom up to near 40F. And the great melt out will begin. This has been an extraordinary month, with Seattle experiencing the greatest February monthly snowfall on record (14.1 inches). You can tell your grandchildren about it. And our temperatures have been unusually cold the last week, with many days not even climbing to our normal minimum. And as good as our few day forecasts have become, our extended forecasts have been...how do I say this tactfully.... rather poor. This is something I am working on---but that should be in a future blog. Can you speak to road conditions when the snow gets rained on, and then the temperatures dip below freezing at night? Does this mean that we can expect school tomorrow? I see a streamer coming southerly across the Gulf of Alaska that looks to build in with existing stream, is that something that the model may have missed? Do you expect it to freeze Tuesday night in Seattle/lowlands (into early morning Wednesday) or are we inching back to our normal warmth? Thanks for your always informative blog posts, and for doing a bit of teaching to the public at the same time as providing your insights to the forecast. Not sure the meaning of "conservative" here. You think Seattle will see more? I can't make out if you are correcting the model with the 1-2 inches or if you are adjusting the forecast. Cliff one thing to note: this is a beauty of a situation for the Hood Canal area/ western Kitsap. If the model shows 4-8 inches as this morning’s GFS does, make it 5-10 or 6-12...cold air is always pushed out too early there. Southeasterly surface gradients. Chances that Seattle schools will be closed tomorrow? What’s the chance seattle schools will be closed tomorrow? 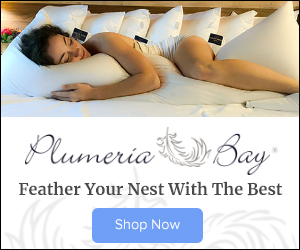 Love that graphic at the end... oopsies! Should we be expecting a rapid warming rain on snow style event? Urban flooding and landslides? I understand the temperature change is hard to forcast. The UW WRF has underperformed greatly lately regarding snowfall forecasts around Spokane.Another 6-8" in the last 24 hours over here.Odd that it's predicting about 2" again for Spokane,while the local NWS office is calling for about 8",with possibly feet in the Idaho Panhandle if the next system stalls out. By the way,the CPC always revises their monthly outlooks on the 31st,and did indexed correctly predict the cold wx for the Northwest.A rather abrupt reversal,albeit. Thank you Professor Mass! You are the one I turn to when something interesting is happening in the weather. I think you have done an excellent job keeping us informed this last week as to what we can expect. Your models and explanations have been quite accurate for where I live on NE Whidbey Island. Light snow falling here in West Seattle for about the past 30 minutes or so. Can't wait to get this over with! Thanks so much, Cliff, for keeping us all informed throughout this drama. Don't know what I'd have done without this blog (and a few others). And please forgive the occasional crank who comes on here and complains you got the forecast wrong for their area. We're all a little frustrated and under stress. 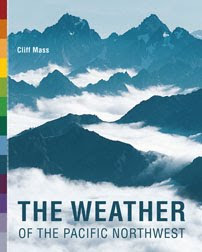 I have your book, "The Weather of the Pacific Northwest," and am giving it a re-read. Science has always been one of my weakest subjects, but I find the weather in this part of the world fascinating. I ended up so far with another 4.5 inches of rain Friday and Saturday and another ~4 inches last night. Total so far, 16 inches (Bothell-Mill creek line). I tried cross-country skiing yesterday and went down to the Corral Pass Road. I was very surprised to see that there was only about 6" on the ground at 3000 feet. I ended up going up to Crystal, where the snowpack is better. I think the long range models under appreciate the effect of The Blob. Go back and look at data with an emphasis on blob intensity. It all goes back to The Blob. Good work getting us through the weather events. You are discussed by name even in our highschool classrooms! I look forward to an in depth look at the strengths and weaknesses of extended "predictions". I realize they are just odds, but still frustrating when they are epically off! Yes, that was a bit of a miss on January's 30-day warmer than normal forecast. I've also noticed that it has been colder here in Bellingham compared to Alaska's Seward Peninsula. Ok help me out here. I read the AFD that said "toughest forecast in the 32 plus years..." but to me it looked like Felton signed it, not Albrecht. Is there some trick I need to know to correctly attribute the AFD sections? It's been snowing in Olympia since 8AM and I'm going out to knock the snow off the tree branches because several inches have accumulated already. Great stuff. It seems long range forecasting is more difficult here in the pnw than other regions...what are the biggest local challenges? Isn’t another storm forming off the coast? Thank you for the hard work and continuing updates! Thanks Cliff! I'll let you know how North Bend fairs through the night. Cliff, I have really enjoyed learning about your process and how the different factors work together to influence our weather. Reading your blog over the years has increased my awareness of what is going on in the atmosphere locally and at times across the world. I was oblivious to most of it until your blog began my education. The more I learn, the more I appreciate the work you and others in your field provide. Of course, I increasingly realize how much I don't know. Thank you for your diligent, clear communication. I like that you keep the facts simple and add commentary that a lay person can understand. Also, I enjoy your humor and that you effectively manage the reader's expectations. It all combines to keep people informed and able to apply the knowledge to their daily lives--especially safety. Woke up to about 4" of fresh powder in NW Bellingham this morning. Overnight temperature fell to 19F. Hoping for another 6"+! !0:53 am. Weather Station claims it's 34 degrees out. Ridgecrest area of Shoreline. Cle Elum Update, recieved 8 inches overnight, still snowing an breezy. Were getting hammered. The road guys are doing awesome though. I have two remaining questions....what are we looking at for flooding as all this snow melts rapidly with the oncoming rain? And what could be in store for us based on the massive storm just now leaving Hawaii? Please tell me it's not headed our way! This past week has seemed even more unexpected given that this is (supposed to be) an El Nino winter. After a quite benign January I was expecting we'd be rolling right into spring with very little severe weather! Cliff, do you have any ideas on whether there will be freezing tonight, and an icy commute Tuesday AM? All in all very impressive forecasting as viewed from the peanut gallery - congratulations! Some of the timing of happenstances were particularly exacting. As an unappreciative aside, could we throw an spent box of powerbars at the IT guy to get the local profiler page unstuck from 4-February? Thankee! thanks for the info. i love the details. Thank you for this. My main question is - should I shovel my Sumner sidewalks again (now about 3") or let the rain get it? It is worth pointing out that that last graphic - the February temperature outlook - is a near spot on portrayal of the winter record of actuals and predictions up until 2 weeks ago, the only significant variation from that being the precise location of the relatively localized cold anomaly, now briefly located westward a considerable distance from the prediction. In other words, while the past 2 weeks suggest a failure in prediction, the past few months demonstrate a comparatively greater Meso scale success and anyway, the slow ain't really over til the fat lady sings, a couple months ahead yet. Surely for a seasonal climate prediction on the scale given, so far the story is one of shining success, not failure. Cannot wait to get the rain back. I love enjoying the snow in the mountains, but this city is just not prepared for it - both the lack of snow removal equipment and the mass hysteria (cleaning out grocery stores and #snowpocalypse after 1"). Bring on the rain! My question is maybe out of your purview but will this snow event have any impact on drought conditions from Canada to California? If I understand correctly some of the smoke over Seattle has been due to drought situations in the forests? Will it melt too quickly from the rain to impact the forests? How is our water supply/snow level looking in the watersheds? I’m betting the the cold air mass holds in Bellingham/Whatcom County at leastbutil tomorrow early afternoon. Right now, NOAA is predicting 5-8” and 30 MPH winds gusts out of Frazer Gap. Not the kind of condictions that would bring us rain - yet. Right on the money. Thanks Cliff! Cliff, thank you for your incredible amount of time and effort on these updates and forecasts, at least for this household they are extremely insightful and valuable. We are east of Fort Lewis at about 650 feet elevation and the first blast Friday night got us about 10+ inches, another 3 last night (Sunday) and has been snowing steady for the past almost 3 hours (its 1230pm now on Monday. Given our elevation at the house, routinely where sea level areas/and I 5 corridor get rain, we get snow....so will see what happens for us the rest of the day. Thank you again, your crystal ball work on this one (for us) - well..... you nailed it! Thank you! We've got a classic rain (snow?) shadow forming over Sequim today. Hurray for the return of the Blue Hole, which had turned into a bottomless White Pit the last week or so. Might stay dry tonight as the SW weather goes around us. Hurray for that! Snow is nice once in a while (a little of it, anyway), but now I remember why I don't like living in snow country. Now if I can just get my tractor to start, maybe I can dig my way out of about 30" of this stuff. "It is worth pointing out that that last graphic - the February temperature outlook - is a near spot on portrayal of the winter record of actuals and predictions up until 2 weeks ago, the only significant variation from that being the precise location of the relatively localized cold anomaly, now briefly located westward a considerable distance from the prediction. In other words, while the past 2 weeks suggest a failure in prediction, the past few months demonstrate a comparatively greater Meso scale success and anyway, the slow ain't really over til the fat lady sings, a couple months ahead yet. Surely for a seasonal climate prediction on the scale given, so far the story is one of shining success, not failure." Not quite sure I would quite describe it that way. The 30 day outlook was drastically revised by NOAA on January 31. The westward miss would be in the 1,000's of miles - a pretty big miss. The one thing both forecasts have in common is the unusually warm Alaska weather, but the cold arctic air is covering a much broader area than originally predicted. In Bryant/Wedgewood area. I'm shocked how much snow has fallen off the trees and just in general shown other signs of melting, while the stuff on the ground isn't quite warm enough to really melt yet. I would be interested when the first person reports that they're seeing rain instead of snow today! 5 inches in Montesano next to our office on the Chehalis river and still coming down hard! I have near calamitous amounts of snow here in West Olympia. Easy 14+++ inches on my roof. How much weight will it hold once it starts soaking up rain as well? Trees sagging everywhere with many branches broken in my yard. It is quite epic. Quick 1 PM update from Bow - snowing! Again! Shoveled driveway for 3rd time - turns out "dusting" was about 1 1/2 inches. Prognosis here is for ... awful ... this PM and all night. More snow. I think the reporting rock has gone like those hummingbirds an Mike Sato's blog this morning. Boy a lot of us here have sure learned some great cocktail party terms and phrases during this fun - now if we ever are able to get to one! In defense of those who stocked up on groceries: kudos to you! Mass hysteria, it is not. I followed Cliff's advice to prepare for Friday snow -- given on Wednesday I believe -- and am enjoying delicious, stress-free meals. And I scored a pair of hiking boots to supplement my usual tennis shoe wardrobe, so am able to get outside and comfortably enjoy the foot deep snow. To those who would say I was hysterical, or should "buck up," I say to you "eat snow!" By the way, a 6 inch diameter fir tree limb just cracked off and crashed into the back yard of my Mill Creek home. At least 12 inches here in Bremerton, near Kitsap Lake. We just knocked some snow off the trees, and cleared snow off a flat roof top deck. It is still snowing very hard at 1:15 pm. Seriously, though, you have a hard job and you are dedicated! It is obvious you are passionate about what you do. Thank you very much for your service! No, Cliff - noooooooooo!!! More snow please!!! If your predictions hold, how much of the snow accumulation will melt tonight? Snowing again in Maple Leaf neighborhood (NE Seattle). Thank you for unpacking the complexities of weather forecasting in a very approachable way - you wonderfully model what a Scientist can do to educate the public about the complex world we live in and the magic that happens behind the scenes. It exactly what Universities need to do more of! 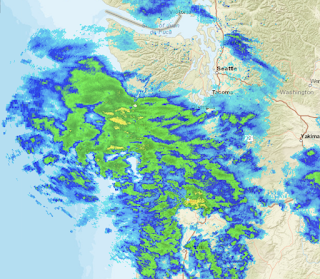 Professor, I've been watching the doppler all day and sure enough, it looks like the snow will switch to rain in about an hour (I live near Olympia). So, great job with a tough forecast! Now what am I supposed to do with all those bananas I bought? Cliff, would you comment on the use of AI in this type of forecasting? obviously it isnt there yet or perhaps it is being used and still has limitations? it would be cool to hear how AI is impacting your science with this specific example of lowland puget sound snow forecasting. I’m moving everything up off the garage floor and piling the snow so it’s more mass to melt slower. And securing more firewood. This looks a lot like the 2007 winter snow-rain-snow storm sans wind (knock on wood) that had major highways flooded in Grays Harbor. It has been snowing hard for the last several hours here in the South Hill area. I've seen some things from local authorities and NOAA more recently indicating this may not be changing to rain until sometime tomorrow now? It doesn't seem Professor Mass answer questions here, but I wonder if anyone else is hearing about this as well. I'm glad we were proactive and got groceries and gas before this all hit. And that we took the time to shovel the driveway this weekend...I can't imagine having to do it with all this added to it. Still snowing like crazy in North Seattle. A winter wonderland! Sub freezing temps holding here in Anacortes. 30 F currently and snowing heavily. Mac - you likely know better than me on that. Still, from the little i saw it looked like pretty good shooting from NOAA, Environment Canada and pretty well all the other outlooks. Which leads to this: As Climate predictions, are not these one month outlooks the same as any other climate model in that the general trend is what is displayed with no offer of any extreme or transient anomaly for the time, space presented? I think its a bit much to expect any prediction other than a generalized trend, and the month isn't even half over. We should actually expect outlier extremes to be left out of the display. That is best predicted in shorter time scale and more regional forecasts. Been following the Weather Underground forecast for Tacoma all day which has been showing 30 more minutes of snow then turning to rain since 8am this morning. 6 hours of heavy snow later and the forecast remains the same. Just 30 more minutes! Cliff, your updates (especially about this recent snow event) have made such a positive difference. Following your posts while on an unexpected trip to the Midwest, I was able to plan my return trip to Oly between the storm systems via Portland AmTrak after flying from Kansas to SLC then Portland. Many thanks for your dedication to weather forecasting and education. 30 degrees in downtown Port Angeles, snowing moderately (maybe heavily). Started snowing around 1:15. Was warmer before snow started again as I was shoveling and could feel the snow get heavier and the surface ice loosen up. Snowing really heavy in Renton at 2pm. Down here at least, the decision to close schools again today was very very wise. Snow still coming down here in north Tacoma (I live about 300 feet above sea level), and I am not seeing any rain yet. About four inches total since last night. Probably two-and-half since 11 today? Snowing heavily now in downtown Seattle! My commute north to Lynnwood at about 3:30 might bea challenge! Getting clobbered on top of QA again. I'd say we've easily passed 18" cumulative. Big flakes still falling on Vashon, have picked up about 2 inches between 11am and 2:30 pm. Not much wind, maybe 3-4 mph. Snow is just turning to rain in Olympia. 2:40 pm. Currently, in Gig Harobr, it is snowing like crazy, and has been all day. (it has also been 37 degrees all day) Our total for the last few days is around 20". Beautiful, but I'm over it! Up to 7" for the day in West Oly and still falling steadily. Some spots in my yard with over 28" drifts. Running total since last week for West Oly (Goldcrest): 2/4 = 3", 2/8 = 10", 2/10 = 5", 2/11 = 7" and counting...not sure we were that ambitious heading into things, but it has been something to behold. It looks like a ski resort here right now! It's not getting any better in Olympia. 17 inches of snow in my protected back yard and no sign of it lettin up. Grrr... been snowing here in West Seattle since 10 a.m. Big, fat flakes. I don't think it's ever going to change over. With this amount of snow on the ground and rain moving in, the melt will certainly result in rising river levels. This snow is holding over 1" of precipitation and warm rain addition will speed the melt and add volume for some remarkably fast river rises, I'm guessing. Hood Canal region finally graduated to a Winter Storm Warning. Still snowing heavily on Vashon Island, I measured 4" accumulation today. Huge flakes, some as large as 2". If rain doesn't come soon and start washing this stuff away then branches and trees are going to start falling on power lines. Fingers crossed that there's no freezing rain! At 3:25, still snowing heavily on Maury (Vashon) island. We're close to another 3-4 inches now, on top of the rough foot we already have accumulated. Ah, winter in the wacky Puget Sound. I love it, even if it's knocking hell out of my shrubs and trees (alas). Holy molly...no rain here on the Key Peninsula (Vaughn). It has been snowing steady since 8 am and we now have another foot + on top of the 11 inches we have gotten so far. Its a white out right now. Branches are breaking under the layered weight of the snow. The road into our community (Minterwood)has a pile up of cars that have spun out and cant get up the 100 yard gradual hill to our road. The entrance is blocked so no one can get in....4 X 4 or pogo stick. 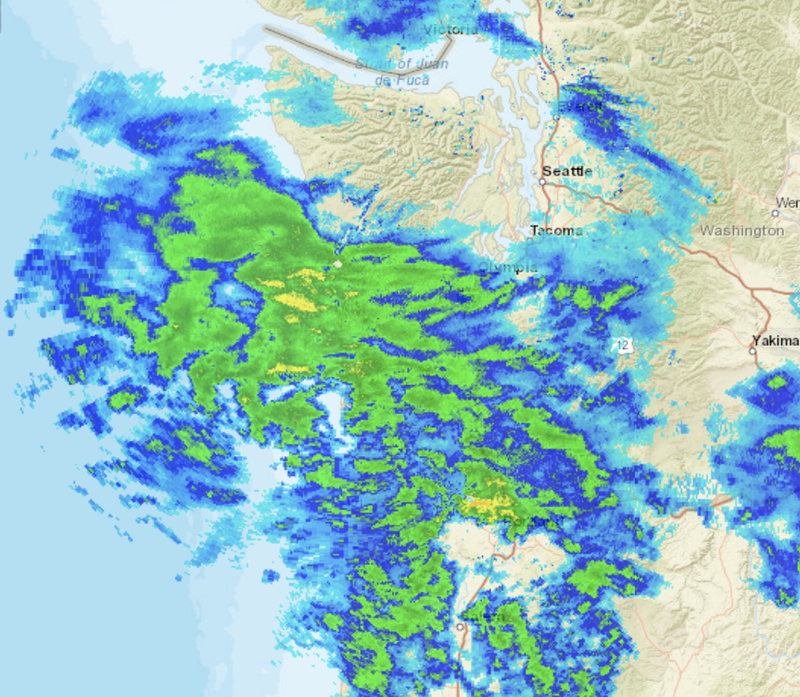 Absolutely dumping in sequim and Port Angeles right now. Harder than Fridays storm. Holy Molly - Key Peninsula has had steady snow since 8 am adding another 12++ inches to our 12++. Currently heavy heavy snow... our driveway to our community is blocked by multiple spinouts that were not a problem yesterday. It's been snowing quite hard here in Arlington for the past hour with no sign of letting up. Olympia's had another 8 inches today, and still coming down strong. Steady snow in white center for the past 2 hours now, no signs of slowing. In Olympia here, we started getting pretty solid snowfall at 9am today and it's still going strong at almost 4pm. 4:00pm in Olympia and still snowing heavily. It's been snowing all day and we've easily gotten over 5" in the last 24 hours. No sign of letting up. Makes me wonder if the bigger snow event is unfolding? Temp dropped to 35 degrees at the Locks, two degrees down since 2:00 and heavy snow coming down. Cliff, We will remember how well you called all of this, starting last Wednesday. Thanks to you we were totally prepared! If you ever want to talk about possible collaboration on the AI model training side, that's my day job over at the factory in Redmond (training infrastructure). I'd be happy to see if there's anything we can do to help. Temp has dropped from 37 to 34 degrees at the Locks in the last two hours, and constant heavy snow. Been sticking for the last hour. Snowing heavily here near Lake Stickney (Lynnwood). There's only been about 5 or 6 inches accumulation in Lower Queen Anne neighborhood of Seattle over the last two weeks. A far cry from snowmagedon, but still fun. Well, this is the alternate scenario full on. I live in Lacey, it’s been snowing nonstop since 7 o’clock this morning, and we have an additional 6 inches for a total accumulation of 18 inches. The current radar on the weather channel app shows us raining, however, it is not raining. Fully snowing, albeit very wet, but continuing to quickly accumulate. The greenbelt hill behind my house has very happy sledders, snowboarders, and even a few skiers. Still snowing in Issaquah and Weather Underground keeps delaying the warm up... nearly pushed into tomorrow at this point... I do have faith that this will end. Eventually! I think you missed the boat on today's post, Cliff. I'm in Meadowbrook and already had two inches by 4 pm. No end in sight. Temperature has dropped from 37 to 34 at the Locks and constant heavy snow. Thank you very much for taking the time to do and post your forecasts. I have quickly learned the last week that you are the "go to" forecaster with your accuracy, THANK YOU! Constant heavy snow throughout the afternoon at the Locks, and temperature has dropped from 37 to 34. I live in Olympia and I shoveled the driveway this morning shortly after it started snowing, there's now 7.5 inches on the drive and it's still snowing. By the looks of this snow now at 4:30 PM how can it turn to rain? It's coming down in buckets and looks to no end in sight! It's going to be a flooding mess when this snow all melts! Crazy. Changed to rain and then back to snow in Kent. Still snowing hard in West Seattle. Nearly an inch an hour. Radar says we should be in winter mix soon. Temperatures have dropped to freezing from 36F this afternoon in Ravenna. You may be right about the models, Cliff. We'll see what the next few hours bring. Right now ~1.5" of heavy, wet snow. At 1640 hours, heavy snowfall in west Olympia. About 6" since it started late morning. Not as dry and fluffy as the original snow. I'm at 14" total, so far. Temp leveled off at 35 degrees and is now down to 34.7. If this turns to rain as Cliff projected earlier today, this will be a serious mess like we had back in 2007 (or 05?). All rain already downtown Seattle. Just made a trip from north Kirkland to Canyon Park. Roads are bad. Coming down the loop from 527 to 405 southbound, my van fishtailed and I was lucky to get control back. People are traveling a sane 30-35 mostly. I got the heck off the road as soon as I could. What's falling now is piling up fast but what's melting underneath is treacherous as quicksand. Snow until 5pm in West Oly, accumulated over 10" since 9am. Freezing rain has begun. 26° and a blizzard in Snoqualmie right now at 5 pm. As of 17:30 hours I've had 4.9" here on Bainbridge Island, and it's still coming down. I think it's safe to say at this point that the forecast of only a few inches of snow before the changeover to rain was a bust. But, forecasters warned that this was a difficult forecast (hence, higher than average chance of busting). Thanks, Cliff. This has been a great week. What weather! Best wishes to Jay Albrecht. I've been reading his summaries for years. It's nice to see his work acknowledged. Here in Central Kitsap, we have close to 2 feet of snow (as of 6:00 pm Monday) and the snow is still falling. Truly, "Snowmageddon"! Rain? What rain? At 6:00 pm Monday evening, we have close to 2 feet of the white stuff here in the Central Kitsap area and it continues to fall. Hey, I am wondering. Just saw some snow depth totals for WA on the west side, from the 19-teens and 1950 that were in the 30 inch range. This total we are getting is unusual, but not unheard of for this area. Are those early snow depths reliable, do you think? If so, what accounts for those big numbers? I understand why we are seeing this storm right now, the polar vortex is wobbling down here, basically. What caused those big storms in the past? [Monroe/Woods Creek, 6:05pm] Woke up this morning to more light snow, then it was quiet until about 2pm. Since then, it has been snowing HARD, and we've already gotten several more inches since last night. We measured a full foot of snow on the ground this morning, and as of when we put our ducks to bed (they basically hung out in their house all day), some of the snow was up to my wife's knees. At the rate it's going, and with it looking like it's going to stay as snow all night, I will not be surprised if we're up another 9-12 inches tomorrow morning. We're now worried about tree branches coming down and a couple of our smaller structures collapsing under all that snow. You're certainly right that this is an event to remember. While I'm not going to have grandchildren to tell about it, we'll definitely remember it for the rest of our lives. Thanks again for keeping us informed of what's going on, Cliff. Well, 6:13pm and still waiting for that transition to rain here in West Seattle. Probably have another six inches in the last six hours. Wow here in Olympia it changed to rain around 430. Before that we got dumped on. We have perhaps 20 inches near the capital. The roads are awful at best. Subaru’s are getting stuck! The warm/cold line has stalled.....All snow for the North until this peters out. 6:30pm and still snowing at our house in North Seattle. Around noon I shoveled for the 3rd time my pedestrian walkway and driveway. Somehow there was more snow than I thought would be there. At 5 I reshoveled the same amount -at least 4 or 5 inches of snow. At 6:30 pm it is still snowing in central north seattle. Where is the rain? About 4"in kings gate since 1pm.... never saw the rain and still going! Thanks Cliff. I'm in NE Seattle and there are a lot of power outages. One friend on Lake Washington just north of Matthews Beach. I'd be willing to bet it is due to power lines breaking because of accumulated wet snow on the lines with rain/sleet converting it all to ice. Holy crap! Must be the apocalypse if Subarus are getting stuck! North of Poulsbo, snowing steady since 9:30 am, 7.5 inches, and still coming down. No shift to rain yet, but some melting at edges of snow on deck. Still snowing at Magnuson entrance. Worried about power lines since Mathews Beach has lost power. 730 pm in Snoqualmie Valley it’s 26° and still a blizzard. 8° colder than Tacoma. Radar shows a major snow shadow West to East with the cascades. Very interesting weather. Yep, it almost switched to rain here on North Rose Hill in Kirkland, but js now back to snow again. Well over a foot total accumulation on our back porch rail. Update at 1940 hours, west Olympia. Very light rain for almost three hours. Snow isn't melting - it's holding that water. Very heavy on the walkway I shoveled a little while ago. Watching a big snow-laden tree branch across the way draping over a taut power line. Could get worse before it gets better. Temp up a little to 36. 20” here in Gig Harbor, 10”-12” since this morning. Snow just changed to rain in the last 45 minutes and it sound like rifle shots from all of the breaking limbs. I’ve never seen it snow as hard here as today, truly a memorable day. We lost several trees and bound to lose more tonight. Snowing hard in Skagit County since 1pm. 14" in Saanich. Still snowing heavily. 17 inches so far in redmond on education hill. 30.7 degrees and holding steady. Still Snowing sideways in snohomish at 10pm. Approximately 8 inches on South Hill in Bellingham. Light snow most of the day but really coming down the last 3 hours. 27 degrees with light NE winds at 10 pm. Nice blogs, keep up the nice chats (blogs) great to read your points of view and insights on weather trends,etc. Snow turned to rain around 8pm here in upper Fremont and its been lightly raining since. Todays accumulated snow on the sidewalk appears to be melting. Or not! 21" in backyard on Finn Hill and still snowing. Not on you, but I wish the NOAA would do more accurate "now casts" and updates. Right now, 10:35, snow has given over to tiny frozen shards of ice (sleet?) in north Kirkland. It looks like rain falling, but the temp is supposedly 32F out there. I've heard a couple of big whumps on the roof - probably branches down, but I suppose it could be a dump of snow. I'm not going out to look. I managed to drive my Subaru all the way home to Clearview from Greenwood this evening-no Subaru’s stuck up here!—and hit rain at Bothell at 6:32 pm. Home now for a while and though it was all dripping a while ago, the weather feels stalled out right now. No rain, no snow falling, just 15 inches of heavy snow on the ground, with the temperature sitting right at freezing. I hope the slush isn’t too deep when I wake up in the morning! Snowplows three at a time in a formation like trumpeter swans clearing the state routes connecting with I-5 in Mount Vernon. This latest snow is very wet and heavy to clear from the drive way, a real widow maker (don't over do it). Neighbor in West Olympia measured the snow that has accumulated over the past few days and said it was 20", which means with compression that we had even more than that. The snow we had just before it switched to rain was ridiculous. Giant clumps of flakes that added inches in minutes. Hey cliff, not sure if the cold air is leaving as fast as thought or if the low moved farther south because here in the foothills of Woodinville, 550 feet in elevation, its currently 29 degrees and the total accumulating snowfall from this storm alone is approaching 13 inches as if now at 11pm. Thrre are currently near white out conditions and its snowing at 2 inches an hour. Should a blizzard watch have been in effect? And why is it still so cold? The nam shows all snow through tonight and tuesday.. this is concerning. Also the depth is 25 inches here in east Woodinville. Models show that Hawaiian low pressure system eventually hitting Northern California and southern Oregon. Dreams really do come true, 10 in on the ground (maybe 14 in total for the 3 systems) in the middle of San Juan Island at 200 ft elevation. Sunny morning then starting about 11am snowed all day 12hr till 11pm. Overcast and calm now, the sledding and X country ski was amazing and looking like it will be tomorrow as well. Cheers to all the weather watchers and the teachers and students studying our earthly climate! Freezing rain here in maple valley. Poor trees are glazed over and you can here the branches snapping from inside the house. We got hammered by the snow up here in Port Angeles (800') yesterday evening/last night. We received over 12" and are in the neighborhood of 40" total since Friday. It's going to be a mess in the coming days. This whole event from Friday to now has clearly demonstrated one thing ... our power infrastructure is C-grade at best. Last night, PSE went from 2500 without power to over 70,000, again. Seattle City Light and PUD aren't doing too much better. This is snow, and these power grids need to go underground or be reinforced in some way (stronger connectors, something). Friday's storm put 200,000 without power (total - not just PSE). Now we're sitting over 100,000 easily. All in a manner of less than one week. Unacceptable. It's 2019, and our power grids are mostly early 20th century at best. The recovery efforts are fine (B+ grade), but we shouldn't have to recover so much. 2-5 windstorms per Fall-Winter and with the exception of anomalous years, snow does fall in the lowlands. That warrants better infrastructure. 17 new inches of snow since noon on Tuesday with more coming down here in Maple Valley/Hobart. We still have power. Eagerly awaiting an update on your blog, thanks! Snowed all night on Education Hill in Redmond, elevation about 280', 6-7 inches of fresh snow on the ground. All I can say is thank gawd I spent 2 hours shoveling off my 350 square foot porch yesterday. I had a solid 18" of heavy wet snow. (yeah yeah getting old) Literally thousands of pounds. Shoveled it bare and still ended up with another 6" of slush after hours and hours last night of heavy snow/sleet at ~1200ft SSW of Chehalis. My thermometer says it's 35º but it's still snowing in Everett. Bow Wa - 9 AM Tuesday. Reporting rock nowhere to be seen - just the string sticking up from about 12 " of snow. Snowing even now but warming up and will probably be messy. All schools closed and being asked to not drive unless need to. I think the region and utilities have done well so far. We just experienced one of the greatest winter events ever. People and employers sensibly responded and shut down those things which could be shut down. People stayed home, cars stayed in the garages or driveways. Roads were available to emergency vehicles and essential services. 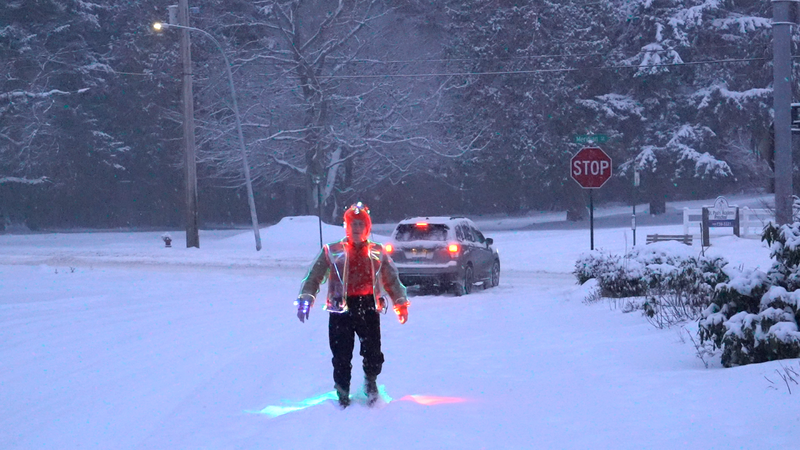 Seattle for the first time ever not merely went to Snow Routes, but to Emergency Snow Routes. And it all was done to plan, not by last minute improvisation. No doubt all levels of government and businesses to will do assessments of how emergency plans worked, and what could be done differently next time. I wonder how many automobiles, pickups,and buses will not have to be repaired because drivers everywhere did not drive, and passengers stayed home. Citizens have a responsibility to be prepared for a few days to look after themselves without grocery stores and utilities. Government and utilities have the responsibility to restore roads and power as quickly as possible. One of the questions I have is how quickly were emergency services available to those needing help, and the same question about 'not quite' emergencies. Thanks @Josepth Ratliff. I was wondering the same thing about power. Storms happen power goes out, but why isn't our system more resilient at the extremes such this weekends, and in particular, last night's weather events? I plan to write the appropriate authorities and cc as many people as I think can (mayor, city council, and so forth). Thank you once again Cliff for the honesty in the forecasts, helping us understand the weather conditions, and the problems and challenges the weather industry faces. I also appreciate that you give us the alternate scenarios and probabilities. Thank you, Cliff! Your work and willingness to share is so appreciated. Still dumping snow in Fairwood. We had limited crossover to rain/sleet last night. Power was out from 1-8 am. Back on now. We probably had an additional 10 inches but its heavy and compressed down a bit. To be clear, I think the recovery efforts and restoration efforts did fairly well (hence the B+ grade). We just shouldn't have to recover so much. I know several people on the east side of the U.S. who have been through MUCH worse, and don't lose power at this scale. So "historic winter storm" isn't an excuse. We do have to be prepared for emergency conditions, I get that, and I am prepared (you could say to low-level survivalist standards). But I'm also going to critique the infrastructure when it could be better (and it can be MUCH better) ... so we can minimize emergencies we have to go through. This is 2019, and we have a power grid from the early 20th century (with minor technological improvement at best). We still use unhealthy wood burning fireplaces for heat. I realize making these improvements cost money AND can't be done "overnight." But "overnight" has been a few decades, and how long do we allow money to be an excuse? Holding governments accountable for project cost overruns and misuse of tax funds may help to free up revenue - holding PSE accountable could help them re-prioritize profit towards infrastructure improvement. I don't claim to have all the answers, not even close. But we have to start somewhere. We have mixed snow and rain here in Grapeview. Can’t see the ground yet but it’s melting! What’s the forecast for today and this week. Hopefully rain! Mmmm, convergence zone/PNCZ tastes like sweet snowy goodness. It's an all you can eat/never ending snow buffet; free refills! Just a snowballs throw from the historic and happening Paine Field in Everett. Enjoy! "This is snow, and these power grids need to go underground * * * ." Putting utilities underground is not a magic solution. Without going into the details, I spent many years working for a business that installed underground utilities, so I have some firsthand knowledge of the subject. Installing lines underground is very expensive, either on an initial basis or as an upgrade to existing service. In some areas, the capital outlay could double electricity rates. Underground utilities may avoid tree and wind interruptions, but they are still vulnerable to a variety of hazards and repair costs are much higher when there is a problem. Underground cables also have a finite life. In some places, underground makes sense while in others, overhead is still the best solution. It is not economically attractive in many areas served by PSE to do an initial underground installation. In many of the dense urban areas, the conversion cost to underground would be astronomical due to the disruption of existing infrastructure resulting from the installation work. A lot of the improvement in the grid comes from monitoring technology that enables a utility to quickly identify problem areas. Much of that has been ongoing for some time. Count me with the group that is impressed at how well our region is handling this event. Perfection is not realistic. Yes, snow laden tree limbs dripped across uninsulated power lines equals tripped breakers. Streets with hills and curves are nasty when ice covered. But too much of modern infrastucture relies on ripping down the trees, blasting through hills, filling in the valleys. My fear is always that people will decide that our natural environment has to be totally sacrificed just to avoid interuptions to our modern conveniences. Take a survey of the students who couldn't go to school and see how many are complaining! A forced interruption to our daily routines can be illuminating. And consider how few reports we are getting of major propery damage or serious injuries, plus the excellent weather forecasting and monitoring technology in place, and our ability to continue blogging with record snowfall!